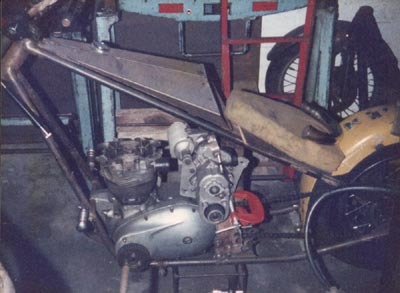 There was quite a break before I started to build this bike, I had been inundated with work in SCM and simply didn't have any free time. When I started working in 69 Cycles I started building this bike. 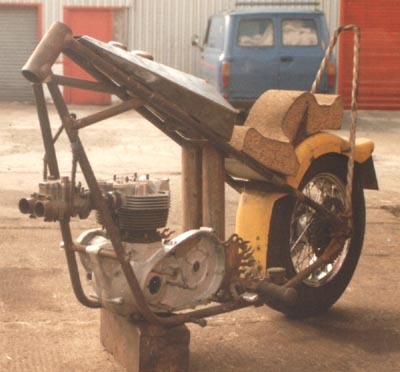 While running SCM I bought a Drouin Supercharger from a guy who lived near Luton Airport, he had it fitted to his 850 Norton Commando, he had flipped the bike when pulling a wheely and took it off, "to much power" he said, I thought "Just what I want"
I built a frame around the Bonnie engine and the supercharger, however when I tried to renew the bearings in the charger I could not get them, I wrought to Drouin, they had none and as they were a manufactured bearing ie. made for them not a stock item, that was that. I decided I would not wait for them to make a new batch of bearings and just modified the build, as u do. I decided to reverse the Triumph's cylinder head and fit a twin 32mm Webber carb. 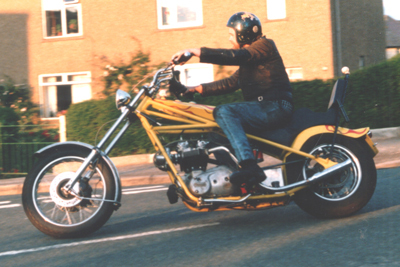 The fuel tank had the speedo and oil pressure gauge fitted into it. 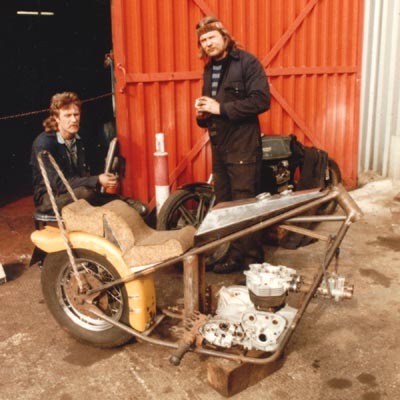 I used twin oil tanks fitted in the frame (OIF) one tank had the hot oil returned to the top of the tank and it feed oil from its base to the top of the other tank. The other tank feeds the engine from the bottom of it, the tanks held 8.5 litres of oil, this insured coldish oil got to the engine first. Again time was against me, I had to junk the twin Webber and opted for the Amals (jetted to suit). 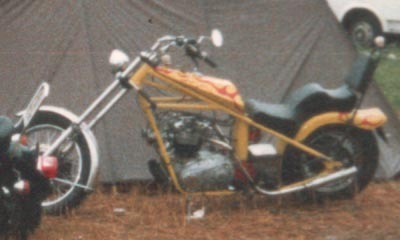 The picture above was taken at the Bulldog Bash Drag Race 1985. 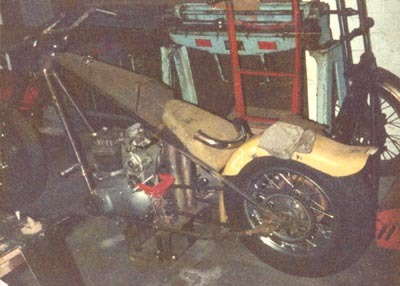 The bike was finished the night before leaving. It had an intermittent electrical misfire which plagued the weekend, it turned out to be a loose connection in the ignition switch. However this was not discovered/sorted until I got it home. I took it up the strip once but it was misfiring so bad I didn't take it up again. 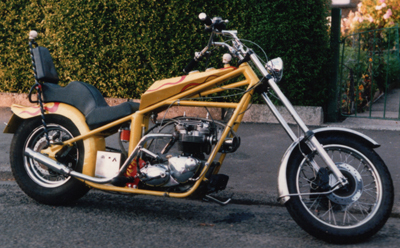 I ran the bike like this until November that year and then decided to rebuild it. Even with the carbs facing forward it never missed a beat, rain or pour. There was a big improvement in performance although I never managed to put it to the test on the Drag Strip.